If you are as huge a fan and user of Pinterest as we are, then there is no way you haven't run into . Pinterest influencer and stylist with nearly 1 million Pinterest followers, Alexandra exudes style and creativity. When she came to us as a new homeowner of a house in Chandler, Arizona, we were thrilled at the prospect of collaborating to virtually design a suave master bedroom for a fashionista who thrives online. Alexandra gave us a blank white room and we worked togther to create a modern-bohemian master bedroom retreat. See first hand how the design unfolded and her new swoon-worthy room. Alexandra was paired with our uber-talented Classic designer, Jessica McCarthy, who perfectly worked within Alexandra's design aesthetic and helped her meet her goals. The bedroom needed to meet both Alexandra design goals but at the same time appeal to her husband as well. Alex adds, "I felt like Jessica was going to push me to another level and really elevate my dreams for the space." Alexandra relayed her vision for a serene, comfortable, and bohemian vibe. A unique and stylish space that would act as a retreat, "a getaway within my own home." As she expressed, "We love waking up to sunlight and airy spaces that feel fresh and clean and cozy. We have never given our master bedroom the priority that it really deserves, and this is our chance to do that." 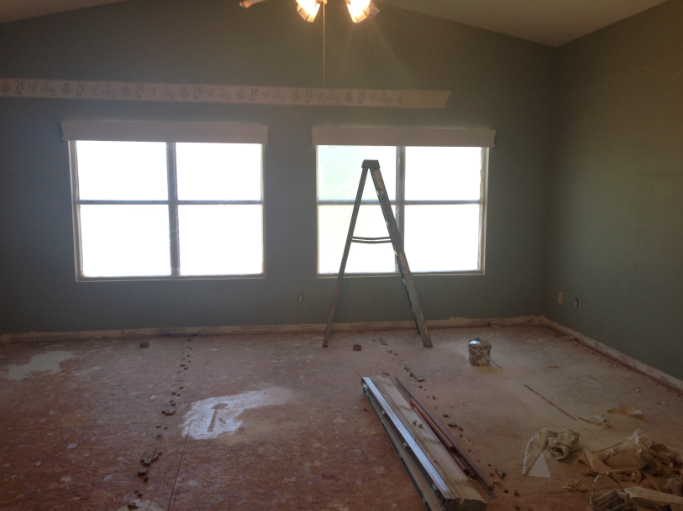 After filling out her questionnaire, Alexandra shared her "before" image of the space. Alexandra's bedroom had no existing furniture, "it's literally a blank canvas," but hoped to bring in a mixture of Moroccan wedding blankets, kilim rugs, modern furniture, and industrial pieces. She also specified a desire for a big king-size bed and beautiful reading area. On top of that, she loves mixing textures, patterns, and neutral colors. 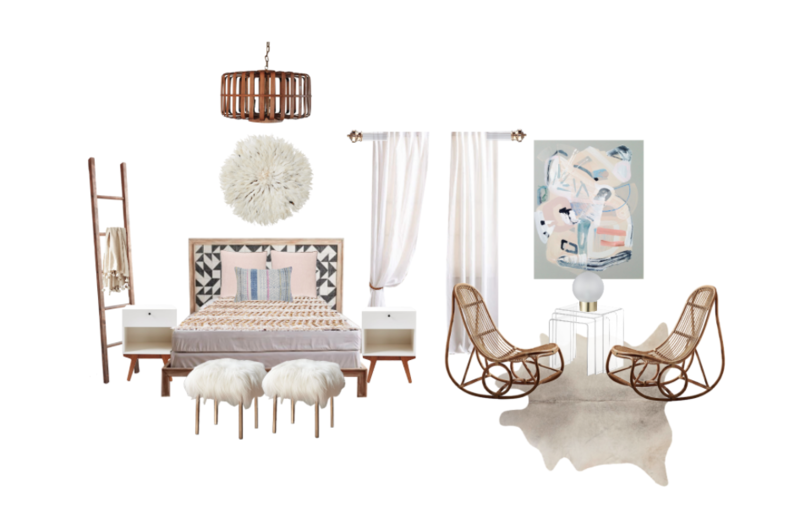 With a truly blank canvas, Jessica got to work and created two concept boards with different ideas for the room, both of which incorporated that relaxed boho atmosphere and specifics that Alexandra was looking for in her design. For concept 1, Jessica was inspired by the light, serene colors of this art piece by a sister art duo based out of NYC. Because the space is shared with Alex and her husband, Jessica used the pink for only subtle accents, and incorporated natural materials to maintain a more gender-neutral feel. For concept 2, Jessica wanted to create something more vibrant. How awesome is that hand-painted cactus wallpaper? She then incorporated hands chairs for an unexpected element, metallic speckled cowhide, and brass light fixtures, to come together for one fabulously unique space. After the initial concepts, Alexandra and Jessica worked together to combine elements in both boards and revise product and layout. Jess explains, "The biggest challenge was creating more of a masculine bohemian space. 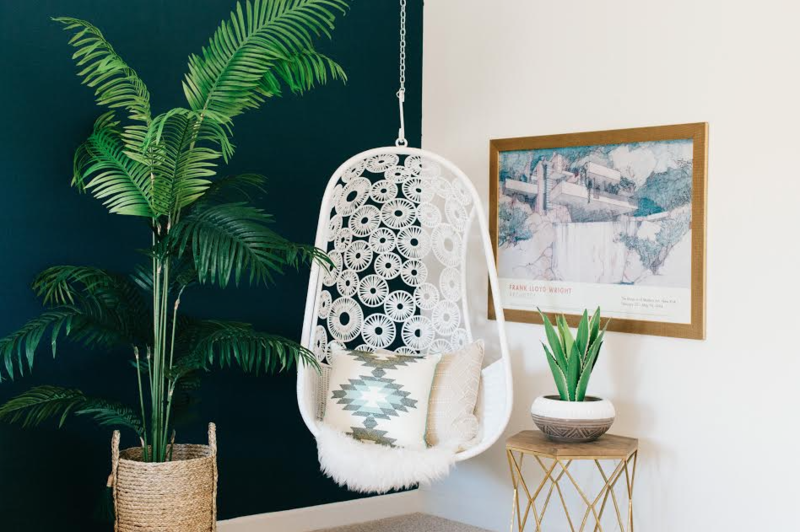 We wanted this space to be gender neutral for Alexandra's husband, but also have a boho flair." They avoided the abundance of pinks, patterns, and florals, all commonly associated as signature bohemian elements. They also went bold and painted a dark accent wall in a lush and unique shade of peacock blue/green, Nocturnal Sea by Dunn-Edwards. Jess explains, "We wanted something trendy but with more longevity than a crazy boho patterned wallpaper." It "turned out to be one of the best decision of the whole process," says Alexandra. After sourcing really unique furniture items with texture, height and scale, the final design concept is nothing short of a show-stopper. And here it is, the gorgeous final design! Full of texture, movement, and bold color, this gorgeous room is the perfect combination of comfortable, fresh, and dramatic. The rattan bed from Anthropologie is really the centerpiece of the space, with a curved canopy headboard. Jessica also drew the eye up with a gorgeous glam brass chandelier, and played up the high ceilings by hanging drapes high on the large wall above the windows. To maximize impact and to take advantage of the room's size, they added a beautiful large-scale Oriental rug and then layered on a subtle cowhide rug. Designer tip: layering this way is a easy way to add a little visual interest to the room and to help break up a large space. The textural Moroccan Wedding Throw, paired with an array of pillows, like this faux fur pillow, plaited metallics pillow, and pick-stitch wholecloth pillow, are little details with big impact that really help to visually fill in the space. The bedside Winding Course Table lamps, add color and a layer of light in the evening. Throughout the room are an array of plants at different heights, to pull the outdoors in. Hanging in the corner to make clever use of what would have been unused space is the unexpected addition of an outdoor hanging chair. "I never thought I would have one inside my home," Alexandra admits, "and I adore it." Safe to say, we consider this modern-bohemian makeover a success story. Now Alexandra and her husband have a serene getaway they both love! Interested in a bedroom transformation like this of your own? 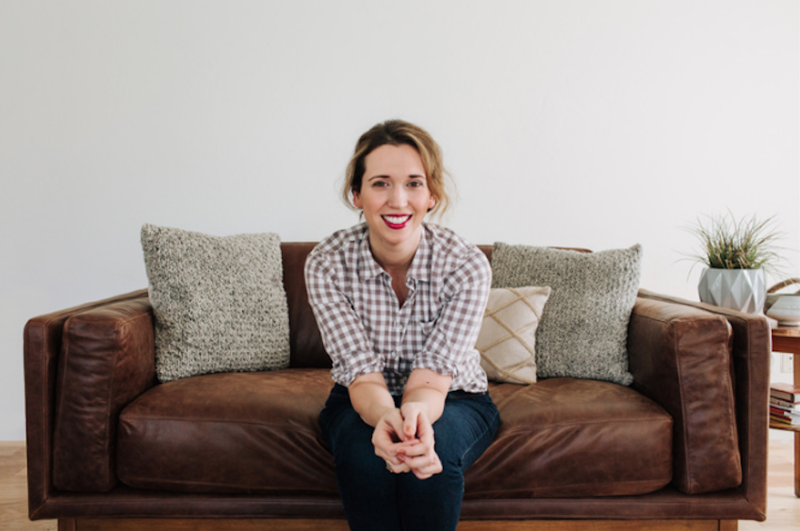 Try a Decorist makeover today!